We're pleased to officially announce we've joined the (stacked) artist roster at TV/film licensors Sorted Noise! So thrilled to be part of their family. 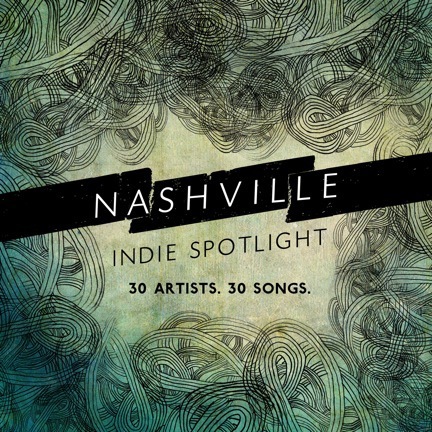 Exclusively available on the Nashville Indie Spotlight! as featured exclusively on Nashville Indie Spotlight! Get Your From Ashes Posters! 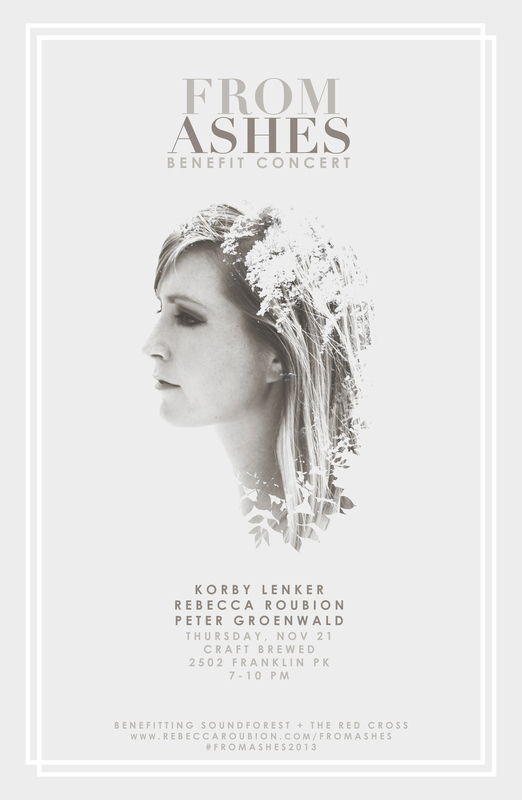 >> We've printed off more "From Ashes" posters due to all the requests! These little babies are available My Web Shop until they run out!! Designed by the brilliant & lovely Holley Maher. a letter from a fan. I received this special note from a man named Jerry - who streamed an online concert and loved the tunes. It's an incredible feeling to know music is capable of connecting with people across the world - it's an incredible realization that you can visit human hearts from the steering wheel of a song. Thank you, Jerry. This one's for you. Thank you very much for creating this wonderful music. I am so glad I first saw you at the beautiful online show with Mark, Jessica and Michael. I received your 2 EPs and am very much enjoying them. And thank you for giving me the opportunity to tell you. I liked every song instantly, each one a gem, and I appreciate them deeper with each hearing. Your voice is unbelievably beautiful, and so touching. Cripple Me literally brings me to tears, and feels cleansing and healing. I smile and mentally dance through Vacherie Girl. Not Sure Yet is uplifting and reminds me to appreciate the gifts of each day. And through it all is intelligence and depth that make it timeless. I am very thankful for your music, and look forward to everything you do in the future. So pumped to share a bill with the great Shannon Labrie, the incredible Emily West and the wonderful Jessica Campbell. 12 & Porter main stage. I'll go on 8 *sharp* !! $5. Click image for show details! No matter where you live, I can serenade you live from a Nashville living room! 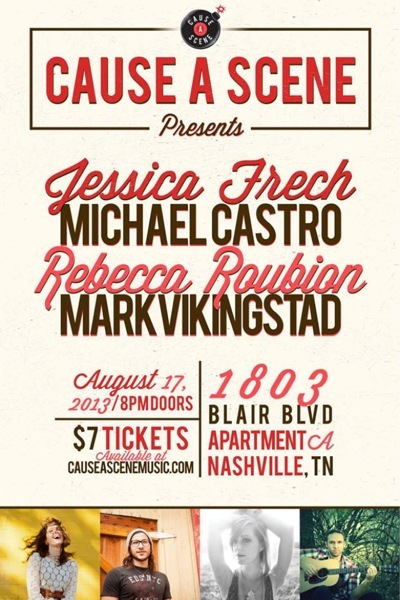 Details and tickets here at www.causeascenemusic.com. Today is the last day to get hard goods for 20% off via my Shop! Click here or simply hit up the "Shop" tab in the site menu and discover the thrifty steals. 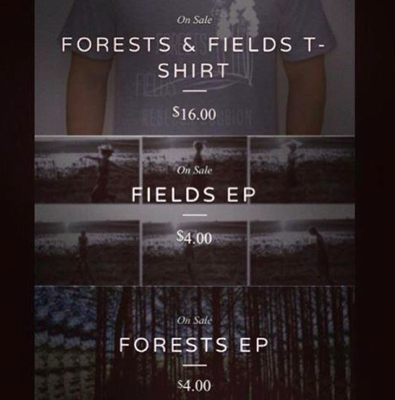 Sale ends tonight at midnight!! 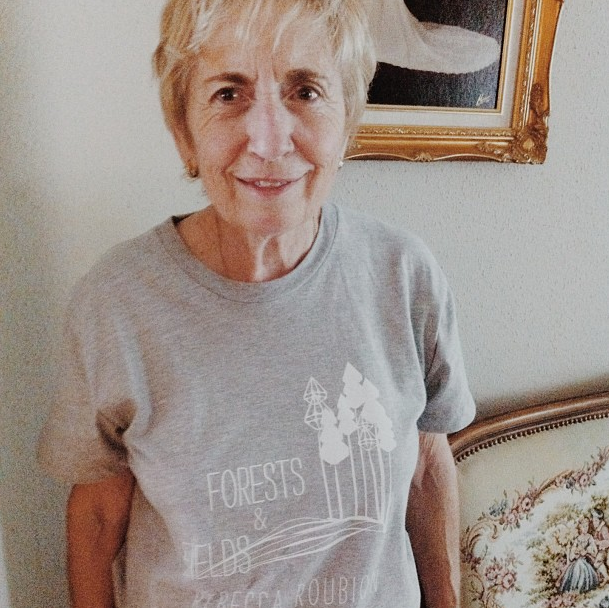 my beautiful MawMaw modeling the American Apparel "Forests + Fields" tee! Mailed hard goods 20% off until 12am CT tonight! Oak Bar, Uptown New Orleans. No place feels more like my native nesting place than this unmatched, Gulf-tipped pindrop of the American South. The debut Nola show Friday truly rocked socks - We had quite a crowd in tow: old friends, new fans, locals - even my dear mom surprised me, parading in with a crew of her cronies! I will never forget that night. Saturday, a "Baton Rougenite" 5-foot ball of sass named Sydney was kind enough to open her gorgeous two-story home for our house show, nestled next to the BR lakes in Southdowns. The audience? Eclectic strangers. Cooler than I could ever hope to be - dressed in plaid and bayou charisma, posed like Kindergartners on blankets in the grass, waiting to be charmed by our melodic incantation. Wes and I in "Red Stick". Nashville's own indie-pop artist Wes Harllee joined me in true Nashville "round" style. Check him out, people. He's doing it. "Laissez les bons temps rouler!" Thank you, Louisiana! You are beautiful. in Uptown, New Orleans. Beautiful. Leisure with my cousin and her lil' ones in New Orleans. Friends, thanks so much for stopping by our new home. Stay tuned for more announcements here. Here we are at the outskirts of the “Forests” – only a few days away from the official release May 7 and the exclusive release on Brite Revolution May 6. We’re so close, just peering into the pit of the wood, in wonder of what could unfold in this ethereal timberland. Taking my songs, and molding and nurturing them into fruition - building an incredible team of people, led by my producer Taylor Bray who would challenge and nourish my craft (behind every good artist is a great producer) - mapping out sounds and instruments that would become the homes these songs could best live in - developing a serious love-hate relationship with a metronome – rehearsing the art of performing, performing the art of rehearsing - brainstorming dark and light album names with friends (Dusk+Dawn, Sun+Moon, Twilight+Daybreak) - laughing in excitement about Kickstarter ideas, and crying amid it’s success – studio dinners and hangs – post-tracking drinks with players and dear friends – crying in the vocal booth because these songs bear my heart and soul – sleeping between vocal takes – pouring all that I have into this dream. We’ve danced in the “Fields,” and now I’m inviting you to enter with me into the “Forests”. In this place - in the pit of the pine, there’s a chill of quiet desperation, and yet the sun is peeking through the trees, dappling the shadows that cover their silhouettes. It smells crisp, fresh. The breeze tickles and taunts. There’s something magical about this place. Initially, I came here after a season of unmatched joy and pure freedom and into one of heartbreak and loneliness – but I’ve learned to master the solitude that confines me, and in it, I’ve found community and inspiration in you. Thank you for walking into the Forest with me and for being my comrades on the path yet to come – wherever it leads next. To my loving parents and family for their great support of my dream. Special thanks to my dear father especially, for his continued guidance and provision. To my incredible producer Taylor Bray, for his genius and collaboration on these songs and all of my career endeavors thus far. To my wonderful Kickstarter backers: This would not be possible without your help - I hope you enjoy the sister to "Fields"! To my fantastic publicist Brannon Desseyn of Starboard Music for believing in me. To Paul Moak at Smoakstack Studios, to Juanita at The Sound Emporium, to Jeff Braun, Dewey Boyd, Henry Reed, Jimmy Sudekum, my designer Sarah Helen Parker of Villa House Pictures, my album photographer Andrea Behrends and studio photographer Ashtin Paige. To all the musicians, to my film producer Henry Reed, the album teaser and Kickstarter video crew, and everyone else that has or will enjoy my music. Thank you. Recorded at Maple Studios, Smoakstack Studios and The Sound Emporium in Nashville, TN. Love Me Now Music Video! It's a bizarre feeling: arriving at a lake destination at 6am to the scene of about 30 people, huge tents, heaters, green screens, ladders, cameras, cranes, actors, snack/ coffee provisions and other miscellaneous film necessaries. All because you were inspired to write a song. Shot by Villa House Productions at Percy Priest Lake in Nashville, TN, this "Love Me Now" was our first official music video in promotion of my debut release "Fields". Had so much fun working with these guys!